I had a reader email with a question about long term storage of rice. The following is the answer I gave her. Although we were discussing rice, these storage techniques work for long term storage of any dry product (wheat, rice, beans, oats, sugar, etc.). I bought a bag of rice and I do not know how to store for long term. Can you tell me the best way to do this? There are a few options for you for long term storage of rice. Some are easier and less expensive than others, but they all have their advantages. The things you want to protect your long term food storage from are light, heat, moisture, and pests. 2. Food Grade Buckets. You can also put the rice in a food grade bucket. You want to make sure you have a bucket that hasn’t had other non-foods in it (paint, etc). These buckets can be purchased new or picked up used at a local bakery for cheap and sometimes free. Add a couple of oxygen absorbers if you can to keep it really fresh (you can pick these up through Amazon or some food storage companies like Emergency Essentials or Honeyville also sell them), but it can go in the bucket with no oxygen absorber and will still keep a long time. 3. Mylar Bags. Another option is to seal the rice in mylar bags with oxygen absorbers. The bags and oxygen absorbers are both available on Amazon. They can be sealed with a special sealer machine or using a hot dry iron as in this video. The only drawback is that the mylar bags are not rodent proof, so you’ll want to put them inside something else that mice can’t chew through (bucket, bin, barrel, etc.). 4. PETE Bottles. For a smaller amount of rice, you can also put it in any cleaned out, thoroughly dried food grade plastic container. Things like 2 liter soda bottles, peanut butter jars, etc. Look for “PETE” or “PET” on the bottom of the bottle. Again, you can add the oxygen absorber for optimum freshness, but it’s not required. Screw the lids on tight. These bottles are generally clear, so it will be best if they’re stored in a location without a lot of light, and they are odd shapes and sizes, but hey, they’re available with no added expense on your part and they work great for smaller quantities of dry foods that wouldn’t require an entire bucket. Hopefully that helps you out some! Let me know if you have any other questions, and all the best to you in your preparedness efforts! Cool, I’ve just started getting into food storage and how it all works. This was a good introduction into the subject for me. I have stored many items and never even thought of rice or sugar (I rarely use sugar and when I do it is organic cane). Question – once buying this and storing it – do you know how many months will it keep? Great post by the way! This may make me sound like some crazy food storage lady, but due to an overzealous rice purchase in 1998, we are still eating rice that was packed in #10 cans with an oxygen absorber that year. Properly stored, rice can last 30 years or more. Check out this study done by Brigham Young University on shelf life of long term storage foods for information on how long other food items will store. Thanks so much Angela! Time to store rice! If storing rice in 2 liter bottles how long will they keep? Where can i purchase #10 cans. What is the best way to store sugar? If stored away from light and heat, the rice in the bottles should still be good 25+ years. #10 cans already filled with product can be purchased from food storage retailers like Honeyville, The Ready Store, Emergency Essentials, Thrive, etc. Check my advertisers. Empty #10 cans can be found at an LDS dry pack cannery, but I’m not sure where else you can purchase those. If you’re canning your own, you’ll also need access to a can sealer (which the LDS cannery has and most will rent out). They are expensive to purchase, so if you’re wanting your food in cans and don’t have access to a cannery, you may just price check the emergency supply stores and get the best deal you can on pre-filled cans. Having food during the times of a natural disaster or emergency situation is crucial for comfort as well as survival. 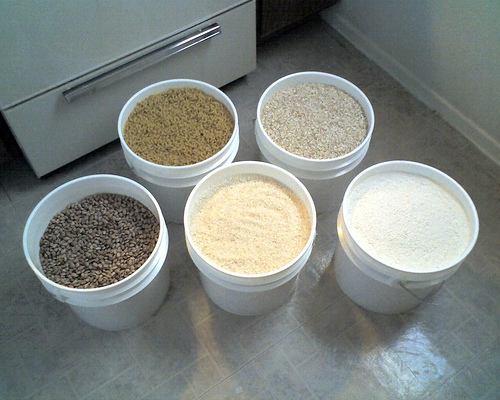 For long-term emergency food storage freeze dried or dehydrated food is ideal. They are lightweight and nutritious with a long shelf life, in some cases up to 30 years. Hello, Great series of articles but I am having a very difficult time finding any type of list of say a weekly menu plan. The goal is not to have a 55 gal drum of rice or other large quantities, but rather a 1 week supply (1-4 weeks) in 1 5 gallon sealed pail or other compact means. Any bug-out I would know if I were able to load 10 pails the 2 of us would be OK for 40 weeks or some other such scenario. Example would be 2# beans, 4# pasta, 4# dried fruits etc… Any lead on a good meal plan per week/month/per person? Lastly, one glaring omission I have spotted, mentioned only 1 time in the series thus far, first aid packs. We’re storing up bare necessaties there too, also in bug-out pails, but difficult without a foundation in medical education. David, your best bet for meals that you could pack a weeks worth in a bucket would be your own favorite recipes adjusted to use shelf stable ingredients, then those ingredients either packed as a meal or measured by the number of times you are planning on having that meal. You can also try recipes from a book called “It’s in the Jar” or from Chef Tess’ 52 jar method. These recipes are designed to be one meal (approximately family of 4 size) all packed in a quart mason jar. They could easily be adapted to bags inside a bucket. Anything wrong with using a storebought vacuum sealer like a “foodsaver” brand and the rolled bag material they use? Those work great, the only things you need to watch out for is that the bags are not very tough, so if you’re packing anything that has sharp points (wheat, dehydrated veggies/fruits/etc.) it can poke a hole right through the bag and let all the air in. The other issue is that they let light in, so you’ll want to at least put them in a box or even better a tin or bucket so you can also keep the mice and critters from chewing through the bag. With the proper precautions, they work fine. I rolled right over your idea! Missed it altogether. The answers can be found in my post. I love your “lists” category! I’ve started storing some rice, beans and other foods in sealed mylar bags stored in home depot buckets. I want to store these food buckets in my garage, but I live in Alaska and my garage gets below freezing in the colder winter months. Will the seasonal freezing and thawing effect the long term storage life of the food inside the bags and buckets when they are properly sealed? Don, the freezing and thawing is harder on the buckets than the food. Over time your plastic buckets may become brittle, but with the mylar bags inside the food should be fine even if the bucket needs replacing. If the food is getting too warm in the non-freezing season, that will shorten the shelf life, but getting too cold isn’t a problem. My personal favourite is the vacuum pack. I make a lot of sausage and smoke meat/fish etc. 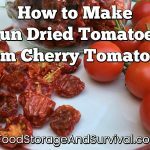 I’ve used a vacuum sealer for several years to protect these products against freezer burn and taste contamination. It seemed like a no-brainer in using the “Seal-a-Meal” to protect dry products as well. So, we have a s4itload of 8 X 12 packages of flour, rice, beans, (add a teaspoon of water per package)lentils, barley, sugar, yeast, baking powder/soda etc. Popcorn, nuts, raisins and anything else you can imagine will last as long in a vacuum package as in a tin. It is also much easier to store although somewhat pricey. The sealing unit cost $120 and the bags are about $0.30/each. But: The results are spectacular. We have berries from last year that are as fresh as the day they were picked. TIP: To avoid a big mess, freeze all juicy products before vacuum packing. This includes meat. We buy meat in bulk, grind and blend it then freeze it on a cookie sheet. Once firm, it can be vacuum packed. We often pack dishes, literally, in the dishes they are prepared in. This method will preserve your jerky or dried sausage for years, no refigeration. Even eggs, milk and other liquids can be frozen and; you get it! If you want to pressure can meat, which is a fairly inexpensive way to get meats in your food storage, check my post on canning meat here. One important point that I don’t see mentioned is that that storage times given are for WHITE rice, not for BROWN. Brown rice actually has a very short shelf life, measured in months rather than years. We canned some long grain brown rice with oxy packs 20 years ago. Opened a can this year and were pleasantly surprised. Taste was the same as the day we canned it. Well, as well as I was able to remember. I am getting older. I plan to pack our rice in one gallon mylar bags and then place the mylar bags into five gallon buckets. To minimize rice pinholes (since rice can punctur mylar as well as plastic), should I first vacuum seal the rice in the food saver plastic bags AND then place the vacuum sealed rice into the mylar bags after that (adding an oxygen absorber into the mylar bag)? I figure double bagging may help, so if the first bag puntures, maybe it’s not as likely the outter bag will (or at least better odds). We are shy on storage space and it also cost too much to buy #10 cans (and in earthquake country, so glass jars not ideal either). Glo- I have never had a problem with rice puncturing mylar. If you would like to double bag it in a food saver bag (which will be prone to puncture), that would definitely decrease the chance of the rice puncturing the mylar. Definitely put your mylar in buckets or other containers to keep the rodents out! Is it important to freeze the rice prior to sealing and storing it? If so, what is recommended? Some people freeze their dry goods before storage–this is supposed to kill any pest larva that are in the food. I do not freeze my rice or other grains, but if you want to, just make sure it is completely dry before storing it. Probably Indian meal moths. They are notorious in certain areas for infesting food storage that isn’t stored airtight. If rice is stored in an airtight container like a #10 can, bucket, or mylar bag, it will not have insect problems. If stored properly, rice can easily keep for 20 years or more. Ziplocks, by the way, are not airtight as I learned by my own experience with those lovely little moths! Do you mind if I ask what thickness of mylar bag you feel comfortable with using for rice? I have both 5 ml and 7 ml available to me. Thank you. Either the 5 mil or 7 mil will work fine for rice. I’m pretty comfortable using 5 mil or higher for sealing any food. I would not have thought of 2L Soda bottles for rice or sugar. I would have assumed they were not air tight since the original soda goes flat after opening them… Am I wrong? 2L soda bottles with their lids screwed on tight make an airtight seal as good as any bucket on the market. I store water in most of mine, but use a few for dry beans and corn I grew and haven’t had any problems. Been reading the blogs, great information! I have a question, how long does sugar and salt store for? My thought is many years if kept dry…I wanted to store it in smaller containers, I have the plastic coffee containers, thought if I bagged the sugar and salt, then stored in the coffee containers, they should keep ok. I could use mylar, or the food saver, Any thoughts? Sugar and salt will store indefinitely if they are kept dry. They don’t need to be sealed airtight, but it’s one more layer against moisture if it is sealed. And don’t use oxygen absorbers for storing your sugar–it will turn it solid like a rock. I’ve used PETE containers – 5 liter water bottles. Where I live we have a real problem with bugs in the rice, usually lasts just a few months before being fully infested. Oxygen absorbers aren’t available locally so I used the dry ice purge method. Works well. Interesting effect is that it creates a bit of a vacuum after the bottle is sealed – the bottle sides get sucked in providing a visual indication if the seal is still intact. For those interested the details and a photo are here Rice Storage Using Dry Ice. I heard that putting a little bit of Diatamacious Earth into each bag of rice or really anything else that gets bugs will help. We have used DE for many years now around the house. We used to drink it every single day mixed with orange juice. It gets rid of parasites in your intestines. We also sprinkle this around our house for ants and cockroaches and and other little critters trying to get into our home. DE is truly amazing. Just make sure you get food grade. It will not harm us at all and in fact is very good for us. It kills small bugs and parasites etc, not by chemicals or anything, but my a mechanical means. It works extremely well. I am reading conflicting things about the mylar bags, their quality and the length of time things sealed in them are good. Any thoughts? Check my post with 8 tips for storing food in mylar bags. There are varying thicknesses of bag and the thinner ones could definitely have some quality issues especially if storing anything with hard corners that could poke through. They have their place, but they are not my favorite storage option. Thanks for your reply :) Your second preferred storage option is food grade buckets, but not with mylar bags? A 5 gallon sized Mylar bag inside a bucket is excellent storage. It keeps the light out better (some buckets are not opaque), and gives your food an added layer of protection against spillage. I’ve heard of buckets breaking if they’re stacked too high or if they have been subjected to extreme temperature fluctuation over time and a Mylar bag liner would keep your food from spilling out all over. Also if you have any concerns about your bucket not sealing up airtight, (a used lid for example), then you’ll for sure want to line it with a Mylar bag and seal the bag. I’d go with a 4-5 mil bag inside a bucket. I actually have quite a few buckets of food stored without Mylar bag linings and haven’t noticed any problems with the food in them when I open it to use it. Absolutely. Vacuum sealing small amounts of food or sealing them in Mylar bags and then storing the packets in a bucket is perfect for those who will only eat small portions at a time. Very nice article! I am currently storing in Mylar bags and I must say you have to be very careful – sometimes even the plastic buckets are not enough to protect them from rodents. And I’m speaking from experience! Interesting article Angela :) One of the efforts is to keep ants, mice, and other bugs away from your storage container. I like to use natural deterrents to keep bugs and pests away from food storage. You can use catnip to keep ants away, lavender can be used for repelling moths, and mint works quite well in keeping away many varieties of insects.